Mike the tiger's Facebook page is inundated with messages like "You are so loved" and "We're pulling for you." 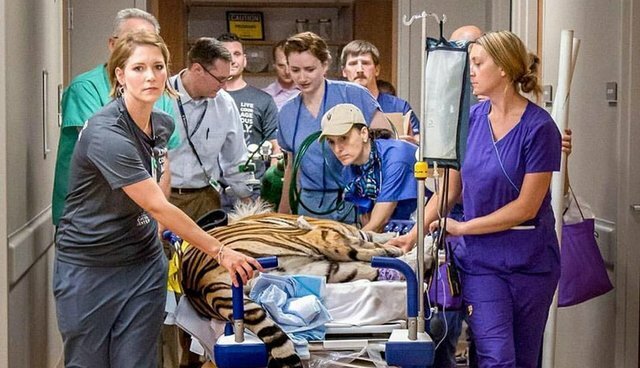 Born and bred as a live mascot, the now 11-year-old tiger has spent his life being wheeled out in front of cheering fans at Louisiana State University. And now, he'll finally retire from the life that was forced upon him - but only because he's been diagnosed with an inoperable and rare cancer. Despite the state-of-the-art medical care he's getting at Baton Rouge's Mary Bird Perkins Cancer Center, Mike will likely succumb to the disease in a year or two. But if anyone had looked a little closer at this majestic animal when he was supposedly in his prime, they might have realized his life had been claimed a long time ago. Like from birth. Mike arrived at the school to serve as a mascot in 2007. He was just 2 years old. 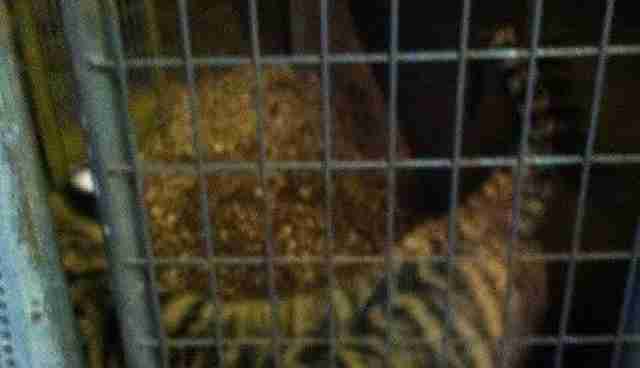 "It is a cruel existence," Susan Bass of Big Cat Rescue in Tampa, Florida, tells The Dodo. "There's probably nothing louder on Earth than hearing people cheer at a football game. It's very stressful to them whether it's a domestic cat or a tiger." What's more, this tiger couldn't even dream of freedom. "They're simply bred for life in cages. They're never going to be released," Bass says. "There is no 'wild' for tiger cubs in America." Mike isn't the only live animal forced into being a team mascot. There's Cam the Ram at Colorado State University. And a Russian boar named Tusk, the official mascot of the Arkansas Razorbacks. In fact, dozens of live animals are kept at U.S. schools for the sole purpose of fan spectacle. But they all have the same thing in common: torn from their mothers as babies at breeding facilities, caged and wheeled into bright, noisy stadiums and, if they survive to be old enough, often dumped. Many end their days anonymously at the breeding facilities where they were born. Some don't make it that far. Indeed, the best outcome for these mascots would be to be released to the care of sanctuaries like Big Cat Rescue or the Wildcat Sanctuary in Minnesota. But pleas from these groups have fallen on deaf ears. Tammy Thies, founder of the Wildcat Sanctuary, has been lobbying to free another tiger, named Lilly, from the clutches of a high school in Ohio for years. Lilly has been bouncing around from breeder to school to breeder all her life. "What she embodies is kind of the whole captive wildlife cycle," Thies told The Dodo in June. "Rarely, do these big cats that are born in captivity live out their lives where they are born. They get traded and passed around. That's really what has happened to Lilly." 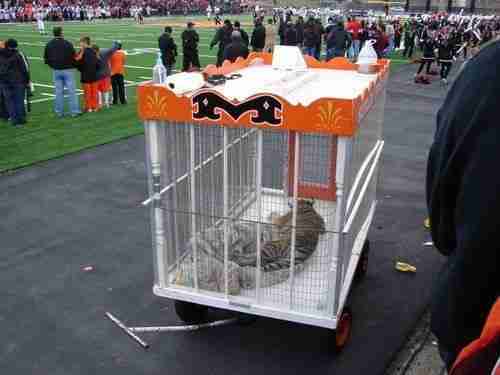 Massillon Washington High School, however, has kept live animals for the last 45 years - and will likely keep that tradition all-too alive. Along the way, these institutions teach the worst kind of lesson. "It also sends really the wrong message to young people - these students who are going to this college - that it's OK for humans to use animals as entertainment, however they want, whenever they want, in whatever ways they want," Bass says. "The fact that someone will take these cubs off the hands of the breeders just entices them to turn around and breed more and more cubs," Bass says. Even Mike the Tiger isn't just Mike. He's actually Mike VI. As in, the sixth animal mascot at Louisiana State University. And there will likely be a Mike VII. 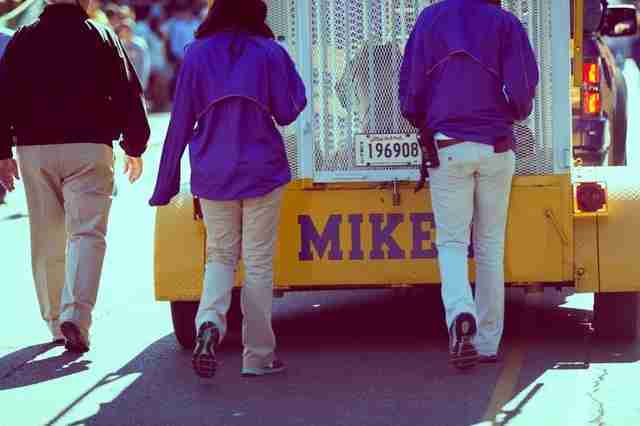 Unless, instead of get-better messages to Mike, we all send get-better messages to institutions like LSU. Like get better at being kind to animals. And maybe even suggest the school go back another time-honored tradition - making humans dress up in dumb animal costumes to prance in front of crowds. At least those humans have a choice. Support groups who fight to give voice to animals like Mike and Lilly here and here. Louisiana State University did not immediately respond to The Dodo's request for comment.